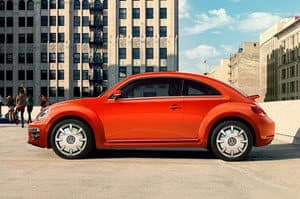 The Volkswagen Beetle is certainly an icon in not just the auto world, but in pop culture in general. This retro ride has spanned over decades, and in the 2018 model, you’ll still find the vintage look and feel of the Bug, but with a modern twist. Whether you’re cruising through Lee’s Summit, Olathe, or Overland Park, your rides are guaranteed to be fun in the 2018 VW Beetle, and our team at Volkswagen Lee's Summit is here to tell you all that the 2018 model has to offer in this review! Remember when you used to play the “Punch Buggy” game as a kid? Now, you could be choosing the color yourself with the 2018 model’s awesome exterior options. Choose from options like Tornado Red, Habanero Orange Metallic, Sandstorm Yellow Metallic, Deep Sea Teal Metallic, and more! And you can take advantage of interior customizable features as well, like choosing your interior ambient lighting color, or opting for two tone cloth seats. Leatherette upholstery is available, as well, along with a leather wrapped steering wheel for a classier look. In addition to its good looks, the Beetle delivers in terms of performance, as well. It may be small, but this ride surely doesn’t move at a snail’s pace. The 2.0L turbocharged engine produces an impressive 174 horsepower and 184 lb-ft of torque, powering you from one destination to the next. Plus, with the 6-speed automatic transmission with Tiptronic® and Sport mode, you’ll switch gears with ease. Switch to Sport mode to add a little more fun to your ride, or to Tiptronic® mode for more precision and control. And with an EPA-estimated 24 city/33 highway MPG, the Beetle provides the perfect combination of power meets fuel efficiency—cross country road trip, anyone? The technology in the 2018 VW Beetle is quite contrasting to its retro vibes. 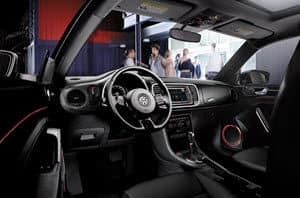 A 5-inch touchscreen with Bluetooth® and a USB port comes standard, while you can upgrade to a 6.3-inch touchscreen with navigation and VW App-Connect technology. Add some extra fun to your rides with features like the Fender® Premium Audio System, so you can rock out to your favorite songs, or tune into one of the hundreds of radio stations via SiriusXM® Satellite Radio. Along with keeping you entertained and connected, the Beetle also offers several advanced driver assistance features that will give you peace of mind while on the road. Such available features include blind-spot monitoring, park pilot, rear traffic alert, and front and rear parking sensors, just to start! Test Drive the 2018 Volkswagen Beetle Today! If you want to be a part of history by driving the classic Volkswagen Beetle, contact us at Volkswagen Lee's Summit! We proudly serve the areas of Lee’s Summit, Overland Park, and Olathe, and would be happy to set you up with a test drive in the 2018 Bug today!